Rain and grey have returned to Portland, OR after a couple of weeks of snow, freezing rain, and cold. For that period we had temperatures hovering around 28F (-6C) or less. Normal temperatures for us are closer to mid 40F (7C). Because of the cold, the 15″ (38cm) of snow did not melt and our area was pretty much paralyzed. Our climate is normally pretty temporate and that much snow and cold is an exception. With rain and the higher tempertures the past two days, there is almost no evidence of snow on the plaza below. I chuckle as I review this last paragraph and I am reminded of the fact that when I was living in Belgium nearly all of my journal entries and letters were preoccupied with the weather. 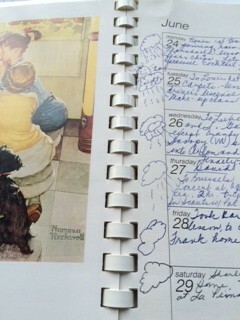 At one point I was even drawing little pictures of the weather (photo at left) beside the day’s entry in my journal. I think the idea was that I wanted to look back at a week or month and at a glance see if the weather really was as grey as I thought or if I was exaggerating. No, I was not exaggerating. I chuckle again! As I loook out at my urban scene below, the grey buildings, streets and sky bring back another memory! In 1986, again while living in Belgium, we had the opportunity to drive what was then called the “corridor”, an autoroute between West Germany and Berlin for a visit. This was before the Wall dividing Berlin was taken down. The main plaza we visited in East Berlin was grey, buildings were grey, people all looked grey in their dark, somber clothes, and the sky was grey. Everything I could see, in that part of the city, seemed to personify the lack of freedom during that time. There were few people in the square and shops had almost no merchandise to view. This visit was an unforgettable lesson. I see a big difference, of course, outside my window. Amongst the grayness I see bright blue, orange, and yellow packpacks, hats, and shoes along with the black and grey clothing. There are even, in the wet, lots of people milling about. Our plaza is alive. As I stop, pause, and think about today, inauguration day in America, I am more than ever aware of how precarious freedom can be. Many of us Americans have drifted along giving no thought to government “BY and FOR the people”, nor have we considered much about the populations that live in the margins with our denial of racism and imbalance of economic power. Big money and gerrymandering have invaded our democracy. I could go on and on. Instead, I will exhale, pause, and breathe. I will allow myself and encourage all of us to take care of ourselves and to be active. We Americans are pretty tenacious when given a challenge. We must move forward with eyes open to the ills that befall us and we must persevere until equlity and the pursuit of happiness are freedoms granted to all, not just the white privileged top layers of society. I just hope I see it in my life-time. It is not a promise!